You may have heard that we had a nice morning jolt here in Los Angeles – 4.4 earthquake! 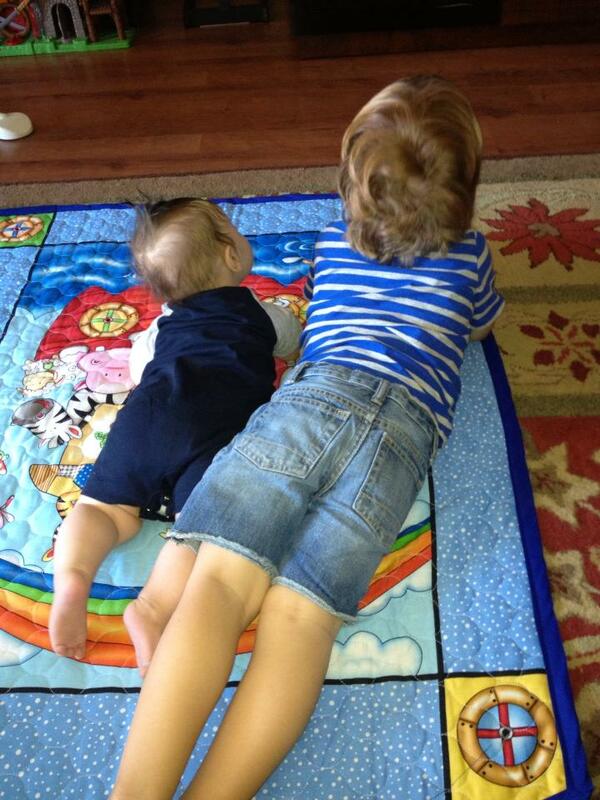 It was the first one for both boys, though only Monkey really got that something was going on. (Not that he was scared, mind you. If you ask him what he’s afraid of, he always says, “Not anyfing!”) Anyway, I woke to the windows rattling and the bed moving around, sat up and realized it was a fairly sizable quake and grabbed the baby and ran out to the dining room. We have a big, solid table that we agree is the safest place to be in an earthquake. Until the MM is a year old (next month! ), we sleep in separate beds on either end of our condo – me and the MM in the boys’ room and DW and Monkey in our room. So we met at the table with both boys and got underneath. Monkey laughed so hard! It was pretty funny – I didn’t have my glasses on, so I was blind as a bat and I put the MM on the breast to keep him from being so squirmy. All is well – no damage, no big aftershocks. Still, I freaking HATE earthquakes and even more so now that we have kids. Ugh. This was a good reminder to get our earthquake kit up-to-date. We have one, but I’m sure all the food items have expired and there probably aren’t the right size diapers or anything like that in there. We also need to move it to a better location. So how have things been going here? Decent, with some ickiness thrown in. Monkey is back to his old ways of getting up super early every day (anywhere between 4AM-5:30AM). Ugh ugh ugh. It seems like it coincided with potty training, interestingly enough. He stopped napping about a month ago (even though he still needs it) so he is drop-dead tired by around 6. We start bedtime at 6:30 and he’s out by 7. Then up for the day ~5AM. We are kind of at the end of our rope with this situation (again). The baby would sleep until probably 7-8AM. I say probably because we don’t really know. I get him up when I hear DW and Monkey are up and put baby in his swing, where he sleeps until around 7-8. DW and I take turns sleeping. This results in far too much screen time for Monkey, too, which I hate. But we have like 4 hours to kill before school (and we are too tired to do much with him at that time of day), so TV/iPad time is too generous. I can’t believe we are still having these sleep issues 3+ years later. When will it end???? Baby F is also having a bit of night trouble lately, but I think it’s because I started working again on Monday. I work from home, so he sees me frequently and nurses throughout the day, but he was used to being with me so much and now he’s mostly with DW. He is having a little trouble napping (goes to sleep easily but wakes too soon) and he wakes with what seems like gas pains frequently overnight when used to pretty much sleep through. He also spits up a lot. He has his 4 month appt. next Wednesday, so I’ll be sure to mention all of this to his doctor and see if there’s any issue. Other than that, he is still a sweet, unfussy little dude. Even the overnight wakings are quickly resolved with a cuddle and shushing – he goes right back down. He is smiling up a storm and just started giggling a few days ago. He is grasping toys and showing an interest in books. Upcoming stuff: We are going to San Diego for Labor Day weekend. Sun and surf! Then my parents are coming for a visit in mid-September, so DW and I will probably do a date night while they are here. Woot woot! We are also going to visit them in early December. That will be baby F’s first time on a plane (he’ll be 7 months) and our first time flying with 2! Also the first time with a lap child. Monkey flew for the first time at 18 months and we went ahead and got a seat for him. Doesn’t seem necessary with a 7 month old, right? It’ll save us ~$400, so we’ll rough it. Baby F had his two month appointment this morning (he’ll actually be two months on 6/29). He weighed in at a whopping 14 lb., 15 oz.! In terms of percentiles, he is “off the charts” on weight. His height is 23.5″ (65th percentile). The nurse referred to him as a marshmallow. Ha! Poor guy had to get an oral vaccine as well as 3 shots. This displeased him, but a little time at the breast afterward helped calm him down. He is one big baby. He is also beautiful, healthy, and happy. He has started giving us gummy grins lately and he is much more alert and has more awake time as well. F still sleeps like a champ – generally going to bed around 7:30 and then I get him up when big brother wakes up (around 5AM – GROAN!) and change his diaper and put him in his swing, where he’ll sleep until about 9-9:30AM. He is an easy, unfussy baby. We are very thankful. We are still very much in our “babymoon” phase – just loving our little guy and having fun spending the whole summer together as a family. I go back to work when Monkey goes back to school (mid-August) but I work from home, so it’ll be a much easier transition than last time around. We still need to work on getting F to take a bottle. We’ve only tried it once or twice and he didn’t want it either time. Sigh. I don’t really mind, but it’s a problem when I need to get my hair done or have an appointment that isn’t conducive to having an infant with me. Big brother Monkey has started getting a bit aggressive toward his little bro. He is still sweet and gentle most of the time, but he will lash out on occasion, so we’re having to monitor him a bit more closely. Monkey has also stopped napping, even though he really still needs that nap. He goes to bed these days around 7PM and is still up for the day between 5-6AM. It’s only been a couple of weeks, so we are still hopeful that he might squeeze in a bit more sleep in the AM. Monkey also started soccer last Wednesday and is doing really well with it. It is the first activity that he’s been involved in that he hasn’t gotten bored and run off within 15 minutes. He sticks with it and seems to be having a great time. We tried one-on-one swimming lessons earlier in the summer, but it didn’t go very well. We are going to try again with group lessons and see how it goes. We have a pool at our condo complex and he loves it, so we just have to find the right instructor/lesson type and I think he’ll be good to go. And in closing, how incredible was that SCOTUS ruling yesterday??? We are now legally married in the state of California and in the US. Now to get these rights across the country. I feel pretty confident that it will happen fairly quickly. Here’s hoping! He seems to really love it – I showed him the picture and he was so excited. 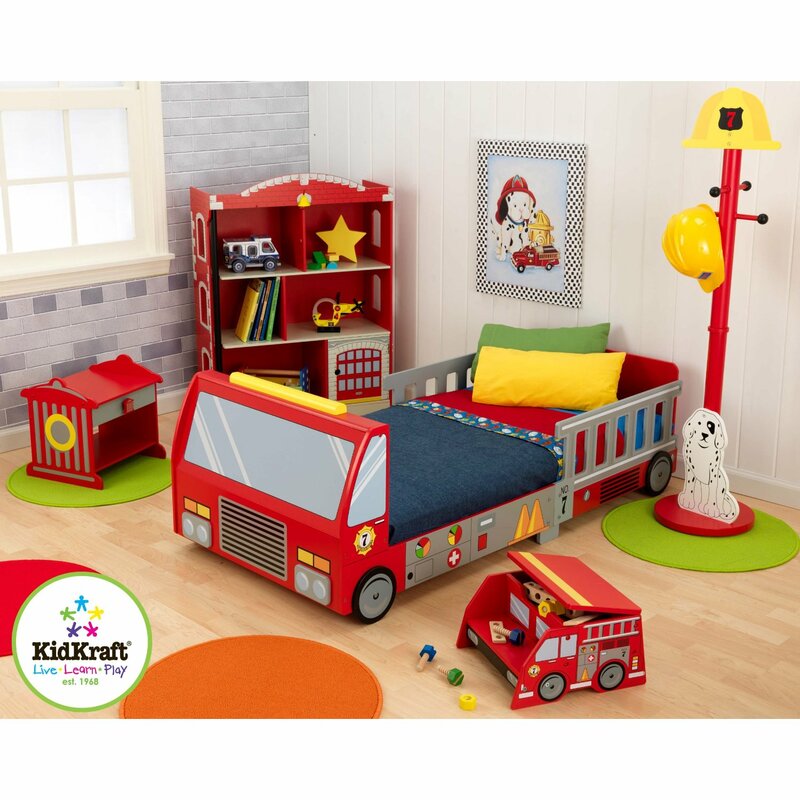 I asked him if he wanted to sleep in the firetruck bed all by himself and he said, “Yes!” It’s not crazy expensive (in fact, it’s on sale on Ama.zon right now), but it’s also not cheap so I’m not sure if we should go for it or not. Have any of you tried something like this and did it work? I know it is early and I have no idea how this new guy will be sleep-wise but I’m spending a lot of time lately worrying about our future sleep situation. We currently co-sleep with Monkey in our bed. We have a queen and he sleeps in between the two us. He goes to sleep there a few hours before we do and we use bedrails during that time. I’m having a hard time imagining what the new arrangement will be once the newbie is here. We have already resigned ourselves to buying a king size bed prior to his arrival, so that will help. I’m just wondering where everyone will be while the baby is really small. Monkey on the outside, between DW and the bedrail with baby on the inside right next to me? With Monkey, he basically slept in my armpit (between my body and my arm) and didn’t really move at all during the night. Who knows if this guy will be the same? Maybe he will be fine in the co-sleeper and we won’t have to do anything different (Monkey was not – he would only really sleep in bed with us, hence the co-sleeping). I’m also trying to imagine bedtime. Sure, early on the baby will just hang with us until we go to bed and Monkey will do his usual routine. But when it’s time for baby to start a schedule, then what? Put baby down first, then Monkey? Will baby sleep through Monkey’s bedtime shenanigans? Maybe put baby down in the soon-to-be boys’ room and Monkey in our bed, then bring baby into our room when we go to bed? And what about when the baby wakes to nurse in the night? Will this wake Monkey and have us partying for hours in the middle of the night like we do now when, God forbid, he happens to wake? By the way, I’d have no problem trying to transition Monkey to his own “big boy” bed in the new room prior to the newbie’s arrival, but DW is not on board. Sigh. Maybe if she were pregnant and trying to sleep with baby knees in her back she’d be more open to the idea 😉 I’m also having a hard time picturing me getting any sleep at all when I am hugely pregnant with Monkey in the bed. It’s a little terrifying. Another concern I have, though it is super temporary, is how Monkey will do with my parents while we are in the hospital after the birth. He has never been away from us overnight before and no one has ever put him down except one of us. Are my parents up to the task? My sad heart is picturing him crying all night long, inconsolable at us not being there. Argh. This parenting thing is so hard! I’m just trying to prepare however I can (like buying the bigger bed) and hoping that it will be a non-issue because the new guy will be a perfect sleeper. I can dream, right?